It is surprising how many Melbourne theatres and theatre companies there are – putting on a daily array of outstanding productions and contributing to Melbourne’s vibrant art and culture scene. Besides the mainstream performance companies, there is a scene of lively independent Melbourne theatres scene. Some independent theatre companies have their own venues, others perform in various spaces. And then there are independent Melbourne event venues that host a variety of shows supporting independent Melbourne theatre.To find out what’s on the performance schedules of independent companies - dance, theatre and comedy, cabaret, physical and music theatre - check out local advertisements. 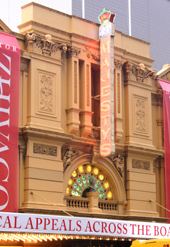 The most established of the Melbourne theatres is the Melbourne Theatre Company. It was formed in the 1950s and is the oldest professional theatre company in Australia, and of the largest theatre companies in the English-speaking world. It is associated with the University of Melbourne and produces a steady and large number of plays each season. The Melbourne Theatre Company is committed to producing classic as well as contemporary Australian and international plays, and is known for its world class artistic excellence. Their motto is that good theatre must contain all that life contains – the seemingly insignificant and the extravagantly momentous, introducing new ideas and ways of looking at the way we live. They have two new performance spaces in the new MTC Theatre on Southbank Boulevard, which can also be rented by any of the independent Melbourne theatres, and continue using the Arts Centre’s Playhouse theatre and Fairfax Studio – providing a stunning array of venues. As a small brother, the Union House Theatre is also associated with the University of Melbourne by engaging its students in professionally led performances. It nurtures emerging playwrights, directors, performers and technicians, as well as student-run productions and initiatives. They have the Guild Theatre, a black-box studio style theatre venue that is for hire and suitable for performance productions of other Melbourne theatres. The Malthouse Theatre, previously Playbox Theatre, produces cutting edge contemporary Australian theatre - particularly exploring what it is to be Australian today. They endeavour to provoke, engage and unleash our cultural imagination through time and space and challenge the very form of theatre itself. They re-investigate the classics, look at the present with a crisp new look, and explore our hopes and fears for the future, by playing our most intimate dreams and responses, engaging our beliefs, fears, empathies and imaginings. The Malthouse Theatre Sturt Street Southbank building used to be a brewery and malting works. It houses three theatres, also for hire, a bar and café. La Mama was founded in 205 Faraday Street, in Carlton in1967. It now has a second performance venue, the La Mama Courthouse, in Drummond Street. It was created after the La Mama experimental theatre club in New York, the seed bed of new work by artists of all nations and cultures in the 60s. Likewise, La Mama in Melbourne is a crucible for cutting edge, contemporary theatre in Australia. It continually pushes beyond the boundaries of the mainstream, by engaging in the exploration, deconstruction and critique of the issues that shape us, giving us insights into our society with all flaws and glory. It nurtures new, unconventional and emerging talents. The likes of David Williamson and Cate Blanchett have come through La Mama. With an open fire place, courtyard and free coffee it is a welcoming place, nurturing the arts in all of us. La Mama Theatre produces more than 50 new Australian works annually - by theatre makers of all backgrounds. Its unique ensemble structure - an established company of actors working together in a variety of productions - has allowed them to develop an intimate and productive relationship between the actors, facilitating a level of professionalism not otherwise possible. Their mission is to create bold cutting-edge modern theatre and give us the opportunity to see a wide range of groundbreaking contemporary dramatic productions that would not be seen here otherwise. The Red Stitch 80-seat theatre is located in 2 Chapel St, St Kilda – opposite the Astor Cinema and behind the All Saints Church (not far from Windsor Station). Melbourne's New Writing Theatre, MKA was founded in 2010 to accommodate a blossoming Melbourne playwrights' community. It creates on the cutting edge, and produces the best new plays by emerging and established writers from around the Australia and the globe. It initially opened in Richmond, but has shifted to the big red, black and white building of the Prahran Mission complex at 211 Chapel St in 2011. The MKA has the vision of developing amazing local talent. It extends an open invitation to be part of this brave theatre to playwrights with an exciting script or challenging idea, or inspired people, such as a designers, directors, choreographers, composers, installation artists, carpenters, film editors to make happen at an MKA. To develop the best new local writing the MKA holds workshops, where new plays are developed. At night the doors are open to the public and you can witness the experiment and development of the story being told - the making a play in progress. The Eagle's Nest Theatre was founded in 2006 by theatre maker James Adler, dedicated to developing the Australian arts. Its output is prolific with around four full length annual plays. It produces innovative adaptations of classic plays as well as original Australian scripts from emerging and established artists. Eagle’s Nest Theatre welcomes a challenge and is committed to community theatre - touring vineyards or wherever else it may take them. Eagle's Nest Theatre has its own studio and rehearsal space in 24 Hardy Street, Brunswick. This is also available for hire. Theatre Works in 14 Acland Street, St Kilda is a creative theatre venue that supports innovative art productions. It has a rich history of quality, alternative in-house productions and, through the imaginative use of its space and resources, aims to entertain, challenge and surprise its audiences. Theatre Works provides a flexible, friendly, technically equipped, well-maintained and affordable theatre space for emerging artists and new ideas - a well resourced open access venue for Melbourne theatres. Circus Oz is a Melbourne born icon that has enchanted Australian and international audiences with their self-crafted circus of breathtaking feats, serious fun, Australian humour, wit, grace and style for the last 30 years. It is a rock-n-roll, animal free circus for the whole family, including agility, death-defying stunts, awe-inspiring acrobatic performances, irreverent comedy, finely-honed stupidity, rock'n'roll, theatre, satire and social comment. Their aim is to amaze, amuse and shake up the audience with their exuberant celebration that lies somewhere between the sublime and the ridiculous. They are based in Port Melbourne, and as a proudly Australian voice are regularly touring the world. They perform in Melbourne during their winter hometown season in their iconic tent in Birrarung Marr. You can learn more at Circus Oz base all year-round, or partake in its High Flying Teams, or innovative team development and leadership program at their base in 40 Bay Street, Port Melbourne. 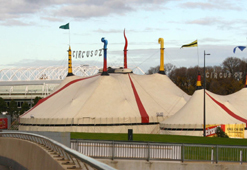 Their Circus Oz Melba Spiegeltent is available for hire at the Docklands. The Australian Shakespeare Company was founded in 1987 in Melbourne, and tours various Australian metropolitan and regional cities and remote and outback locations - from Melbourne and Sydney’s Royal Botanic Gardens to Kakadu National Park and Beswick Falls in the Northern Territory. Their mission is to present exciting, accessible and contemporary productions of Shakespeare and other dramatised classics to common Australians through their innovative and unique theatre performances. Every year, they bring the finest professional theatre to families and friends through its magic open air performances. Shakespeare Under the Stars is an annual Shakespeare play in the Royal Botanic Gardens in Melbourne, and The Wind in the Willows is a popular show for the family in both Melbourne and Sydney. The Australian Shakespeare Company has the ability to adapt their extraordinary plays the needs and locations of particular communities and venues. In Melbourne, they utilise various venues, such as the Athenaeum, Shed 4 in the Docklands as well as Rippon Lea House, and a venue in Mount Macedon. Chamber Made Opera invites you - with their Living Room Opera series - to the edge of opera. They will bring opera into living rooms, artist’s minds and other places you would not normally expect to find it. They premier Australia’s freshest and newest voices and challenge the notion of what opera and music theatre can be. Chamber Made Opera is the leading development and production house for contemporary opera and music-theatre. It is committed to present music theatre works by living Australian artists. They tour extensively, with 80 performance seasons across four continents. Magnormos was founded in 2002 as a dynamic musical theatre company, with a focus on producing original Australian and lesser known international musicals. OzMade Musicals, in the Comedy Theatre Melbourne, is Magnormos' annual one-night-only showcase of the best Australian musical theatre, past, present and future. The Arena Theatre Company is one of the Melbourne theatres for young people, creating live performances for people, aged 5 to 25 years, since 1966. Their vision is to engage their audience by creating surprising, alive, fertile, explosive, dangerous and inspiring spaces that give young people the opportunity to have their unique experiences expressed, felt and reinvented. Arena productions attempt to investigate and celebrate the diverse, complex and ever-changing young person’s reality. They believe that theatre is a vital and evolving art form capable of engendering transformative experiences for young people. The Arena Theatre Company performs at spaces such as the Malthouse theatre. The Act-O-Matic 3000 is a talented actors' company, producing an exciting mix of dynamic theatre. With a Green Room award and various nominations under their belt, they have premiered a number of powerful first-class Australian and international works over the years. The Ranters Theatre has been producing many internationally acclaimed productions since 1994. They have been touring around Europe, the US and Canada, coming back to Australia for the spring Melbourne International Arts Festival. The National Theatre in St Kilda was established in 1935 with the idea of providing professional training for young opera singers, dancers and actors. This later led to the establishment of the Australian Ballet, Opera Australia and existing State Theatre Companies. The present National Theatre today has a professional Ballet and Drama School, as well as a versatile and attractive performance venue for a wide cross section of community arts, ethnic, multi-cultural and educational groups. St Martins facilitates performances and drama workshops for young people, aged between 5-25 years. It was founded in 1934 as the Melbourne Little Theatre - now called the Randall. St Martins also offers long term venue hire and is located in the St Martins Lane, South Yarra. Fortyfivedownstairs is an intimate city space used by Melbourne theatres and for art exhibitions, showcases emerging, independent and experimental artists and productions. It is located in the top end of, in No 45 Flinders Street – downstairs in a beautiful19th Century building - and has an intimate theatre space and two gallery spaces. Fortyfivedownstairs aims to present evocative new and classic theatre productions, encouraging new ideas and innovation, and provide opportunities to artists, performers and independent Melbourne theatres. Since its opening in 1995, Chapel of Chapel has hosted notable artists such as Coldplay and Shirley Bassey. It is a space that delivers dynamic performances of Melbourne theatres, comedy, music, cabaret and dance, as well as exhibitions. Chapel Off Chapel is a progressive arts and entertainment venue that has been described as the hotbed and vanguard for the arts - artistic and cultural excellence. Theatre Husk is a resource for creative spaces - for hire, lease, share or to occupy for theatre and arts projects. They have affordable spaces in Northcote that provide emerging and established theatre practitioners with room for quality performances, rehearsals and theatrical explorations. The Northcote Town Hall in High Street, Northcote is a dedicated venue for the Arts and Melbourne theatres. It has three fully equipped performance spaces and has become a hub for theatrical performances, festivals, exhibitions and events. It is a great supporter of the community and their cultural and artistic endeavours. The Runcible Spoon is a small theatre located upstairs in the beautiful old building of The Owl and Pussicat Gallery – in 34 Swan Street, just across from Richmond Station. It also contains exhibition spaces and a bar. The theatre is a versatile space incredibly that is ideal for small productions, cabaret, burlesque or comedy. There are a number of mainstream and landmark heritage Melbourne theatres that host a variety of performance, including great popular shows and international stage productions. The Arts Centre Melbourne is located in the heart of Melbourne’s arts precinct. It is home to Australian theatre companies as well as international performances. The landmark building of the 1886 built Princess Theatre in Spring Street stands out as one of the most magnificent Victorian buildings in Melbourne. It regularly hosts a variety of Broadway shows and musicals. There is the 1929 ‘picture palace’ of the Regent Theatre in Collins Street, just up from Swantston Street, that attracts many mainstream musicals to Melbourne. It also has the Plaza Ballroom in its basement, an impressive extravagant Spanish gothic hall available for hire. Across the road is the Athenaeum Theatre, one of the oldest of Melbourne theatres. It is venue to many productions, including the Bell Shakespeare Company and the Melbourne Comedy Festival. The exotic Forum Theatre, opposite Federation Square in Flinders Street, appears to be out of another world with its lavish moulded plaster, gold paint and reproduction casts of famous Greek and Italian sculptures and soaring blue ceiling punched with stars. 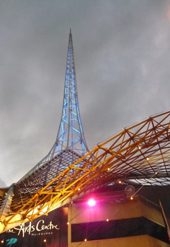 It hosts cabaret, rock concerts and the annual Melbourne Film Festival. The 1886 art deco Her Majesty's Theatre in Exhibition Street is where Dame Nellie Melba sang her first opera and the ballerinas Anna Pavlova and Dame Margot Fonteyn performed. Today, it hosts a variety of theatre, dance and musicals. The Comedy Theatre, also in Exhibition Street - a mix of a Florence palace and Spanish interior - presents a variety of theatre and comedy today. The 1924 Capitol Theatre in Swanston Street, is a classic Art Deco theatre. It was the first Australian picture palace, designed by Walter Burley Griffin, and is a popular festivals venue, such as for the annual Melbourne International Film Festival. The 1920s Palais Theatre in St Kilda fits with the grandiose Art Deco theatres. It is one of the largest theatres in the southern hemisphere and functioned as a cinema til the 1950s. It then became a venue for shows, opera, ballet and musicals, and today is a live music venue where you can frequently find international legends. The Brighton Theatre Company is one of the community Melbourne theatres an produces a range of theatre and comedy to drama - by a wide variety of Australian and international authors - providing an entertaining night out, with four annual stage productions. The Clocktower Theatre in Moonee Ponds, once known as the Essendon Town Hall, is a state of the art community facility for the performing arts. It presents a vibrant annual program of theatre and performing arts, comprising Theatre Season as well as a Morning Music program. 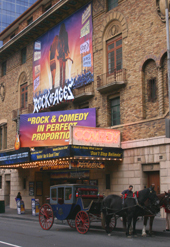 It is also a venue for hire for other Melbourne theatres.